Momma Told Me: With a little creativity any supplies can be made magical. In the guise of genetics I was born with a disposition for weak knees- as a result, at 11, my left knee went out while washing some dishes in the kitchen. I landed on said knee, tearing the meniscus, and ending up in a full foot to thigh sot cast for several months. What does this story have to do with Halloween? Well, being at that tween age, on the cusp of no longer caring about childish holiday traditions, and them being the only thing of importance in the world- that is the Halloween in my life that stands out the most. I remember for months I sulked and pouted, upset about my circumstances, and 'rightfully' taking it out on my parental units. Whenever Momma would ask what I wanted to be for Halloween that year I'd furrow my brow and clench my mouth. I wanted absolutely nothing to do with Halloween- it was 'ruined'- my adolescent mind had decided. That is, of course, right up until 5 days before the actual holiday, when the excitement of friends making plans, and the street full of haunted decorations began to finally break me down. All of a sudden I was no longer upset that my knee has ruined the holiday, but that I had. I remember one day plopping into our minivan in tears and, with very little prodding, divulging to my mother how I so very badly wanted to trick-or-treating, and how everything was ruined because I had no costume, and a bum leg. Of course Momma was determined to teach me a lesson of never giving up. And, while our Halloween eve's are often in the 80-90s, and she truly had no desire to follow me door to door- she knew that likely would be one of my last childhood chances to truly get out and enjoy the holiday as a kid. The following day I opened our front door to see our dining room counter sprawled with crafting supplies- a grass skirt, a carved bamboo stick, and lots of colorful fake feathers. In just a few hours, while I had been at school, that day she had created an entire costume literally from a few things we'd had laying around the house. Even better- my 'witch doctor' costume would help hide the hideous grey soft cast I'd been so self conscious of lugging around. And the homemade apple 'shrunken heads' would even dangle nicely from my crutches. Yes, Momma taught me several great lessons that Halloween- but my favorite is that holiday magic happens, truly, with just a little bit of imagination. You don't need to spend a ton of money, or time, to have a wicked god time, and today I'm sharing a little bit of that spirit with you. 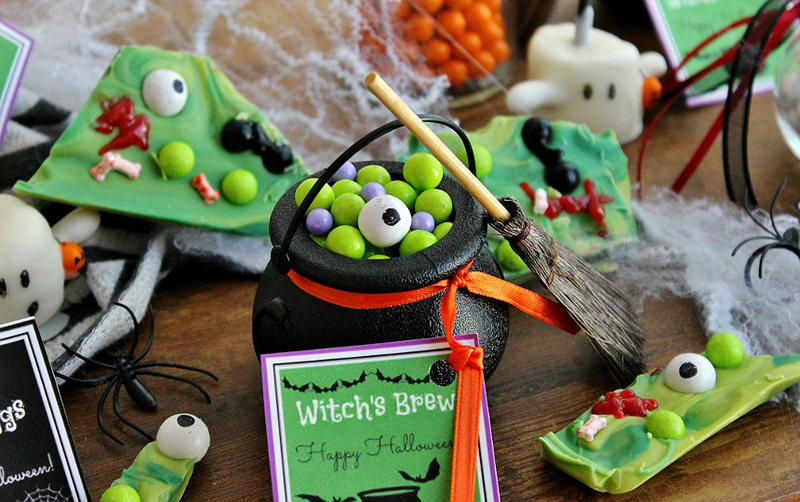 If you have some old candy cauldrons or plastic jars rattling around, some marshmallows and candy melts, a few Celebration by Frey™ and/or Sixlets® bags are all it takes to whip up some spooky sweet treats for entertaining this Halloween. Celebration by Frey™ and Sixlets® products are sweet confection decorating candies or little candy coated chocolate balls, which come in a variety of colors and styles. 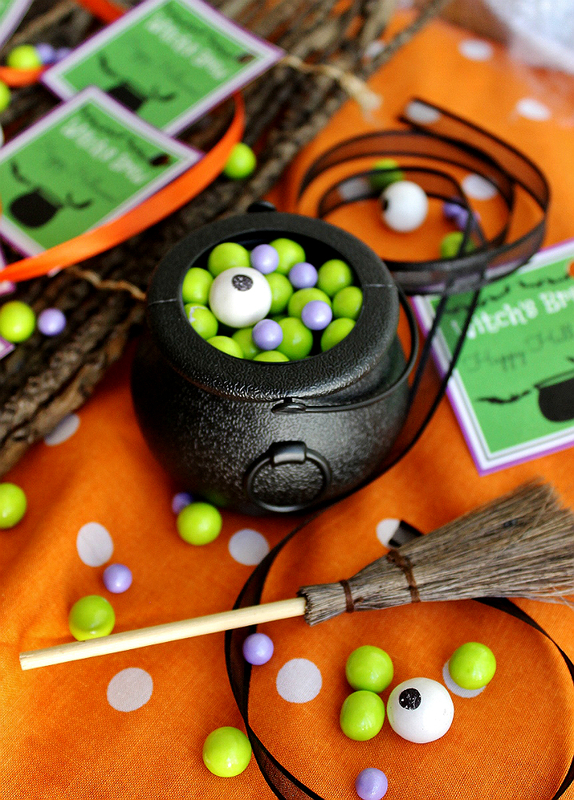 (You'll even find delightfully spooky gumball eyeballs for seasonal characters and chilling creations!) These products are often found in the baking aisle at your local Walmart, Hobby Lobby, Wegman's or more- the selection and colors change seasonally, so I always stop by to see what's new. 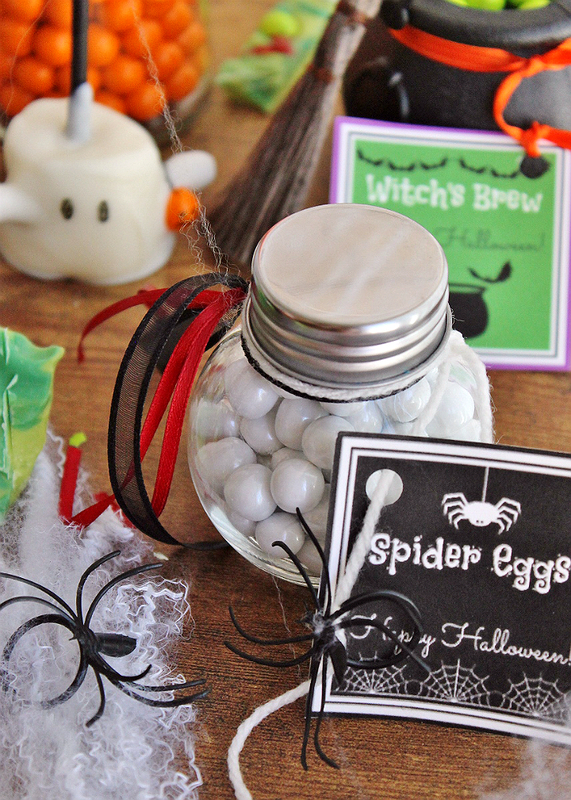 Sixlets chocolate candies are one of my favorite choices for cake decorating and seasonal treats- I've essentially combined different shapes and sizes of Celebration by Frey™ confection and Sixlets® in 2 frightfully easy party favor creations- Witch's Cauldrons and Spider Egg Vials. 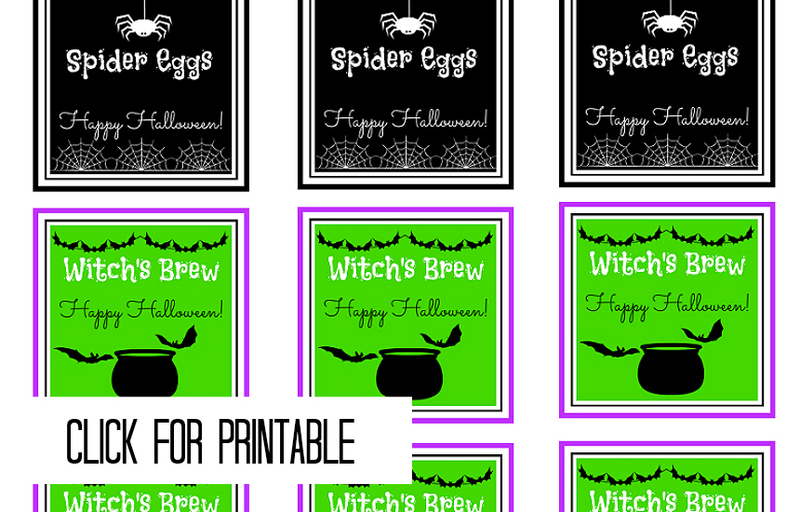 With our FREE Printable above any age an whip these up. 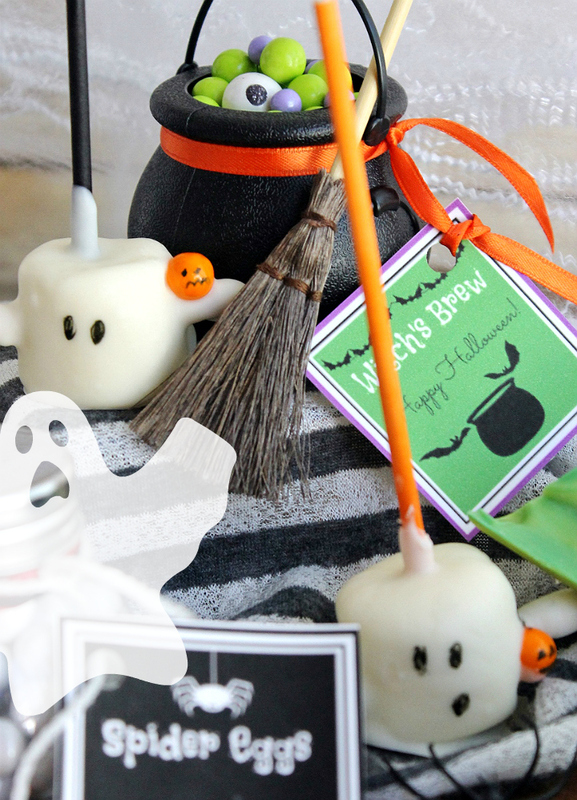 Add some seasonal ribbon, fun decorative brooms, and gumball eyeballs for a really wicked treat. Sixlets are also my go to because they offer a vibrant pop of color at an affordable price- and are especially fun for playing with texture- Just check out my simple Frankenstein bark, below. 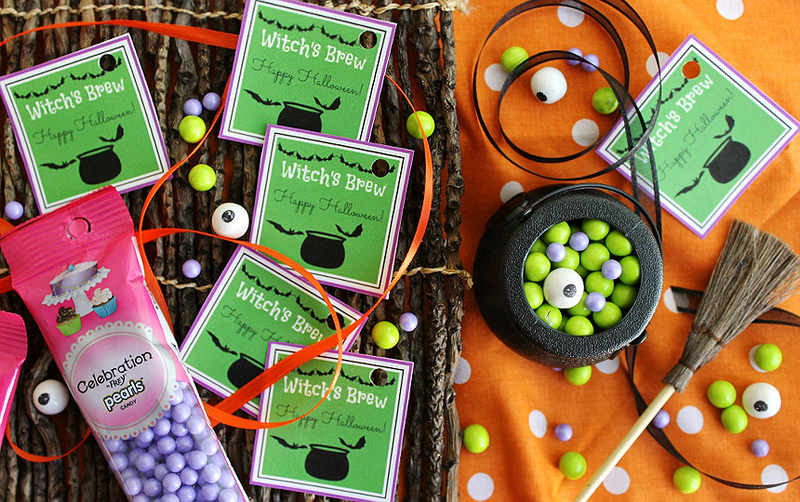 All you need are some green chocolate melts, lime green Sixlets chocolatey candy 'boils', a red glitter 'blood' candy writer, eyeball gumballs, and any other fun sprinkle additions you feel fit the mood. It may look a little silly at first, but this bark will break up into delightful fractured treats with a real 'stitched' vibe! I also used black Sixlets and some melted chocolate to create little 'bolts' for an extra dash of character. The swirls in the chocolate will even give your bark a rippled 'skin' texture that is ghoulishly fun! 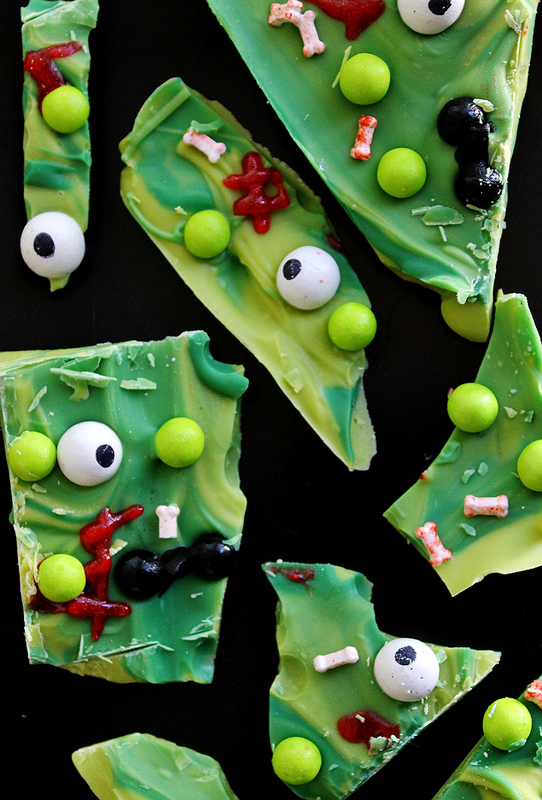 The Frankenstein bark is literally as simple as melting chocolate and pouring it into a parchment paper lined baking sheet or pan- then liberally apply sprinkles, Sixlets, and other decorations as the artistic mood strikes. Send the pan to the freezer for about 10 minutes, then break apart into chunks of various sizes. Our final spooky selection involves all of those leftover marshmallows you inevitably have laying around after all those Summer S'mores events. Using some cake pop sticks, pierce jumbo marshmallows in the center, to create a standing 'pop', then take a pretzel stick and run it through the center horizontally to make 'arms'. 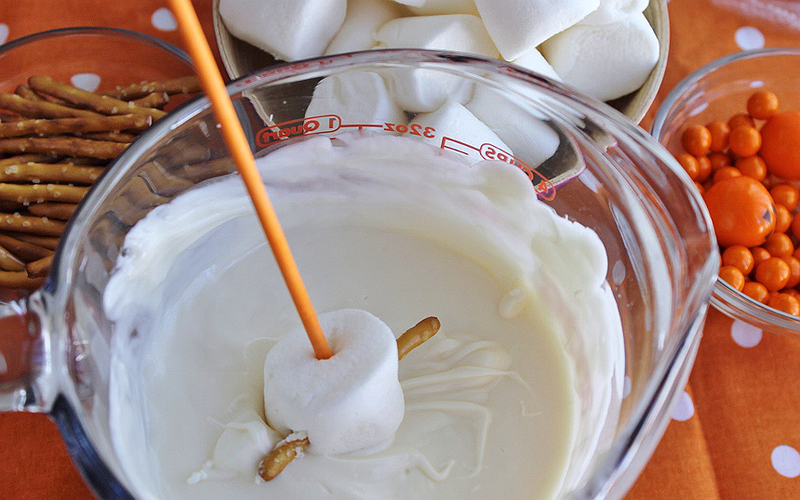 Dip your treat in a bowl of melted white chocolate and place the an orange Sixlets at the nook where arm meets marshmallow. Set upright on a baking sheet and place in the fridge for 10-15 minutes to set. 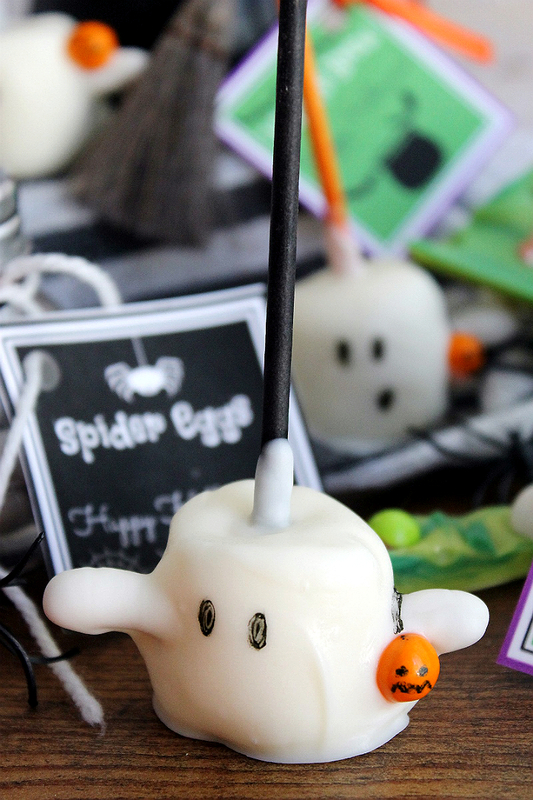 These 'boo' ghost pops are much easier to make than traditional cake pops, and lighter to enjoy among a giant Halloween spread. Use a food grade marker to decorate your orange Sixlets with a pumpkin face, and to add eyes to your ghosts for some frightfully fun final touches. I whipped up this entire Halloween spread in about 90 minutes- Momma may have spent a little more time on that infamous last minute costume, but the sentiment remains the same. Holidays are meant to be fun, and delicious- you shouldn't have to shell out all of your hard earned cash, or time, to celebrate them. 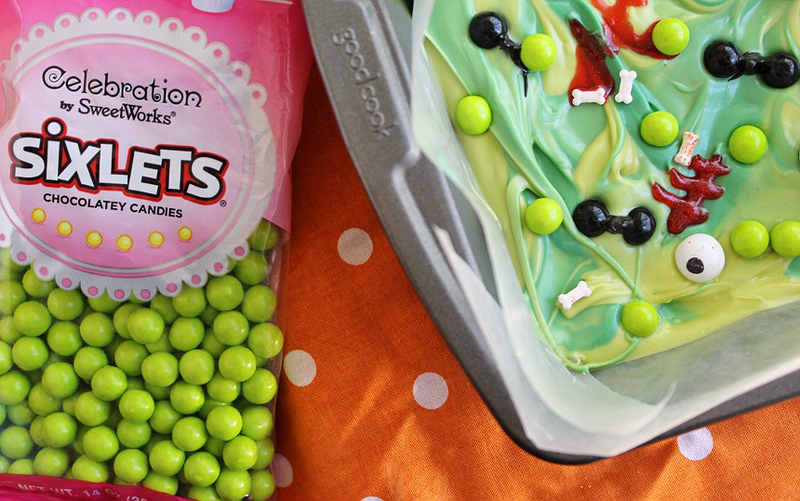 Celebration by Frey™ and Sixlets® are just two of my secrets for Halloween entertaining success. What Daughter Says: You don't have to be a Martha Stewart to pull off a fun Halloween spread, just use a little imagination! I like the black and white candy crumble! Because it could be used for many different things. I want the google eye gumballs. I will be Mom of the Year! I wouldn’t mind these Snowflake Mix Pearls Small Peg Pouch, I think they are pretty and thinking all the wonderful things I can do with them.. I think the Halloween mix gumballs would be a great choice. There are colors of the season and then the kids would love them. I like the Halloween mix Sixlets shaker jar. My kids would have a great time decorating cookies with them. I have got to say that you have the most creative items from this hop! I was really impressed! BRAVO. I would get the Halloween mix gumballs because I think the kids would love them. 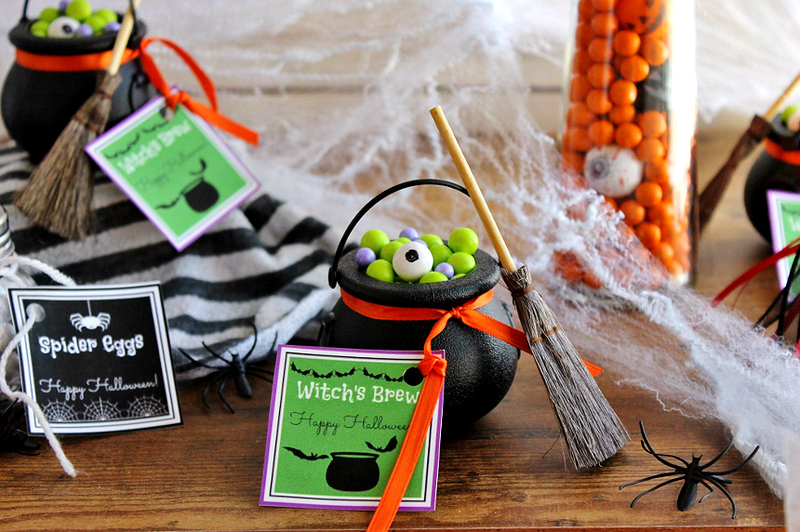 My favorites are the Halloween Mix Sixlets Peg Bag (14oz)! They are pretty vivid colors and I really am wanting to make the recipe you did with them! We would love the Halloween mix gumballs and the Nerd filled gumballs. My daughter would love to have these because the girl is constantly chewing gum. She would love the decorative colors and the nerds. I like the Googlie Eyes Gumballs Peg Pouch because I think that they are funny! Celebration by Frey™ is precious! What on earth is better than eyeball gumballs? I think that the Witch’s Brew and the Spooky Eyes Gumballs are cool! I think they make for some fun designs. 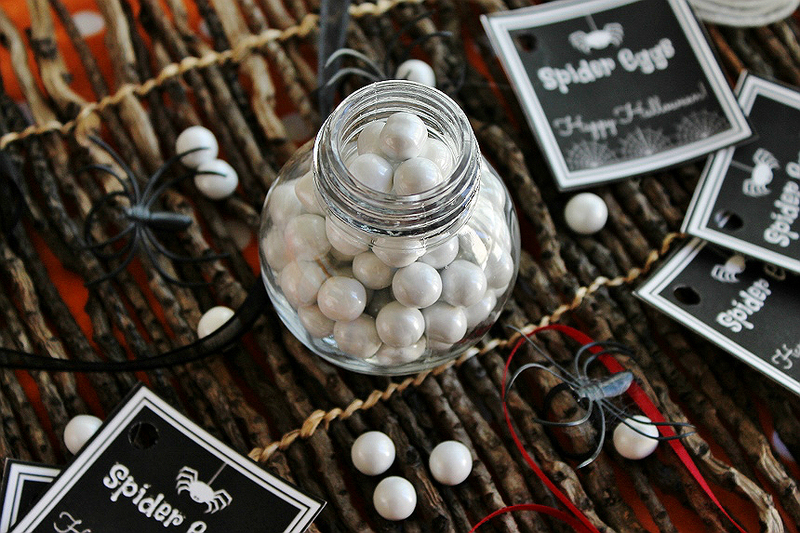 I want to use the black gumballs to make spiders to give out. Black gumballs sound so interesting. Foiled Solid Milk Black Hearts because it symbolizes my love for Halloween. It is spooky, creative, quirky, and reminds me of my favorite movie Edward Scissor-hands. I am loving the Frankenstein bark. I love throwing Halloween parties and this would be a perfect addition. 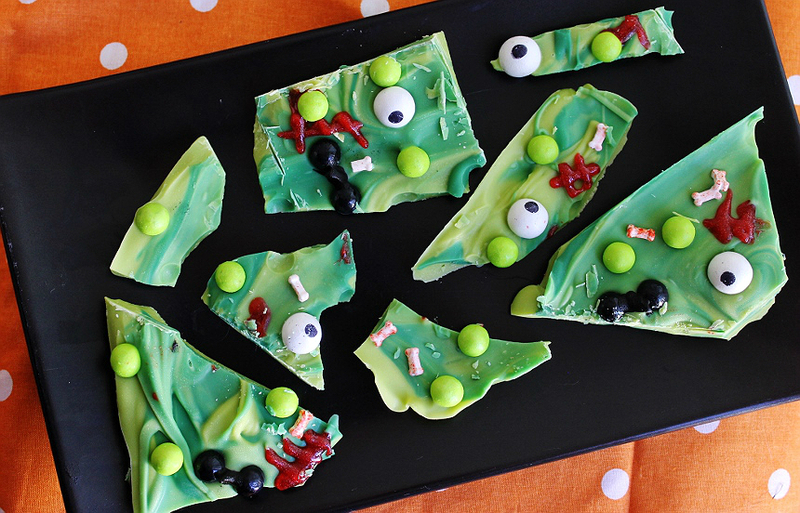 I love the Frankenstein bark! Not only does it look super cute, but I bet it is tasty! So creative. I love the Black and Orange bags of gumballs the most. 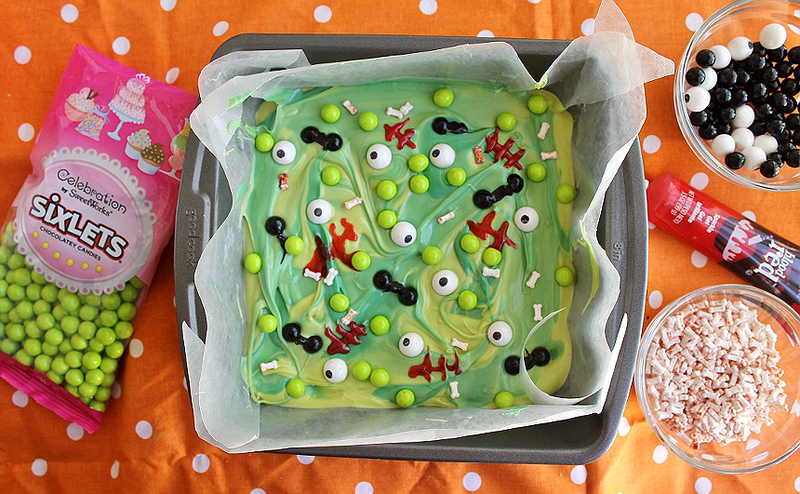 Not only would those make great eyes on a cake, but I like gum so it’s tasty too. I love the cauldron idea! And just think, those little cauldron's can be saved and used as decoration. 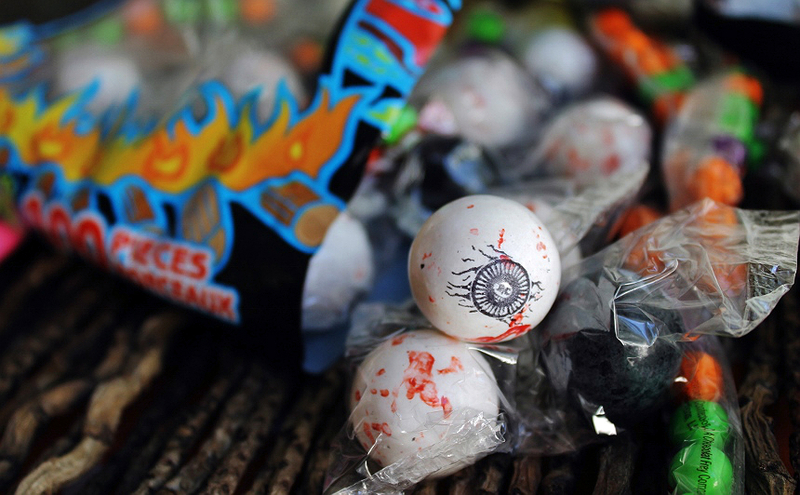 I would like to get the Celebrations by Frey's Spooky Eyes Gumballs because they would make great Halloween gifts for my nieces and nephews. 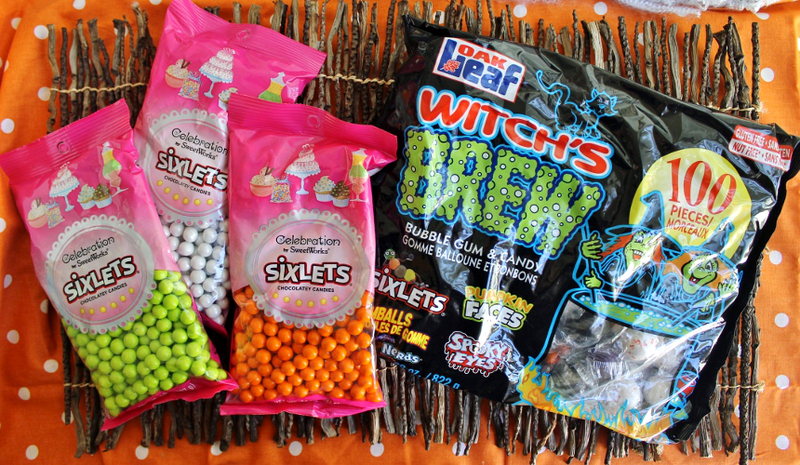 I like the Halloween Mix Sixlets Peg Bag because of all of the colors! I would love to have the 8ozPeg Bag of Spooky Eyes Gumballs! With four kiddo's, ranging in ages, we are huge Halloween fans and these gumball eyes would be perfect for all the classroom parties for everything from cupcake decorations, to candy spiders! These really would make a difference in making the homemade treats looks fabulous! I like the Shimmer Orange Gumballs because they look so pretty. I really like Sixlets so I would want to get the Halloween Mix--I love that mix of colors! I would layer the Halloween Mix Gumballs, Spooky Eyes Gumballs and the Googlie Eyes Gumballs in a tall glass decanter. I will use this as a centerpiece for our dining room table. Wow you are creative..love your bark and I'd replicate that! 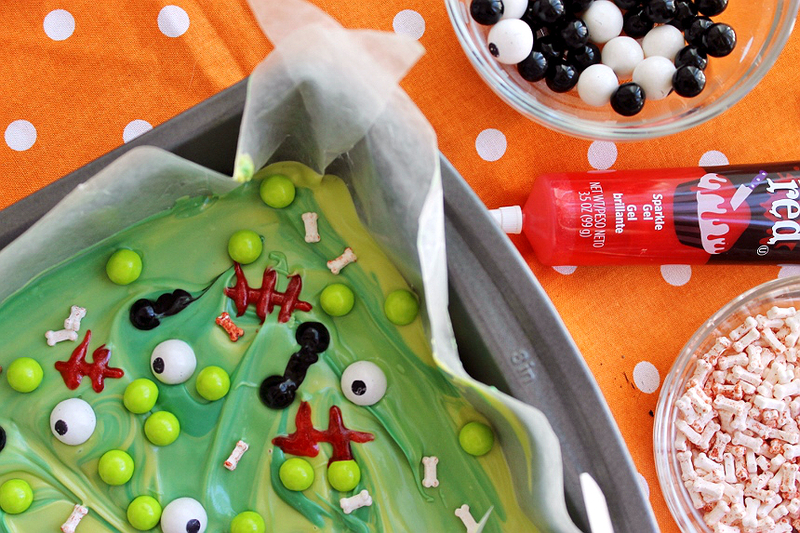 I also like the eyeballs and Halloween mix. Snowflakes for my Christmas cakes. I really like the Halloween Mix Sixlets Shaker Jar! I would get the Halloween mix gumballs. I love the Googlie eyes gumballs. I would like to get the Shimmer Lime Green Sixlets Shaker Jar (4.5oz) and the Orange Sixlets Peg Bag (14oz). I would decorate cookies or chocolate pops with them for a Halloween party. I love these colors also! I like the sixlets the best and the grandkids love the gumballs. I really like their Halloween Mix Sixlets Shaker Jar. We were planning on baking cookies and cupcakes and letting everyone decorate their own. This will make that really easy! You guys are making me hungry tho. I may have to make some chocolate bark too! Yum! I want Shimmer Orange Sixlets because Halloween is my favorite holiday and I know I can whip up some awesome creations with those! I would love to try the Shimmer Orange Sixlets Stand Up Bag candies on my Halloween cookies. I'd love to try the Chocobloc Orange Bar! Orange Shimmer Sixlets, perfect for Halloween cupcakes. I would like to get the brown and orange sixlets because they were a treat as a child. 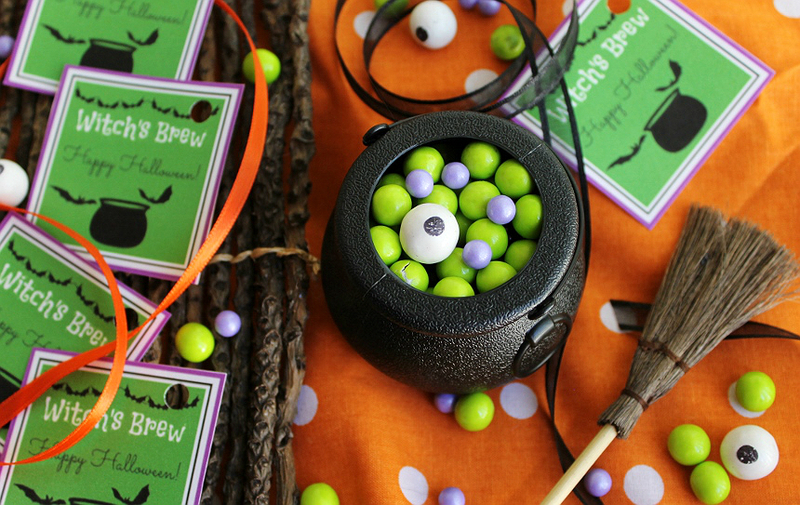 I would love to get the Spooky Eyes Gumballs Peg Bag so my daughter & I can decorate our Halloween cupcakes! 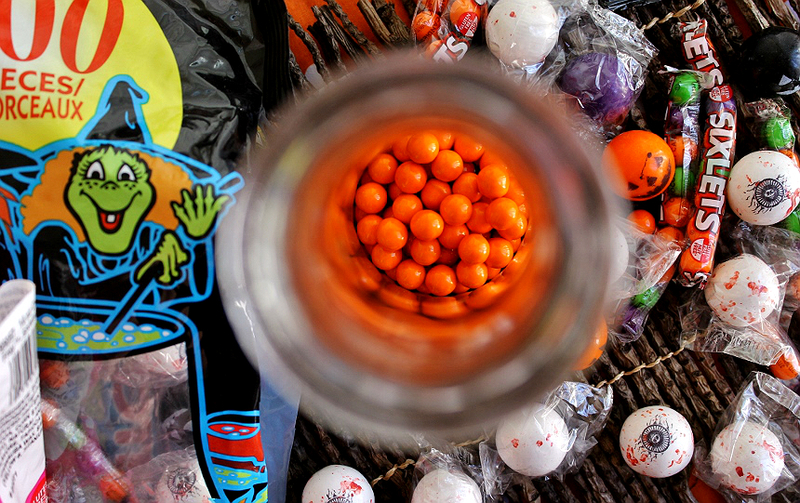 I like the Halloween Mix Sixlets Shaker Jar because I think it would make a pretty cupcake or cake topping . I would most like to give and get the Googlie Eyes Gumballs Peg Pouch because it seems clever and silly. I like the Foiled Solid Milk Pastel Blue Hearts of the Frey's Celebration collection of fine candies becaseu they are so delicious.